I decided to start with my latest read. I'd picked up this book because of its description and 100% didn't regret it! The book basically talks about how women don't ask for many things in their lives, like a promotion or a pay raise, and often avoid negotiating, therefore losing a lot of opportunities and often getting paid less than they deserve. "By neglecting to negotiate her starting salary for her first job, a woman may sacrifice over half a million dollars in earnings by the end of her career." This book opened up my eyes to a lot of things and made me more aware of what's going on with the world and how we can as individuals and as a society change the current status of a pay gap. I think that if you read this book and actually start to ask for what you deserve, this can seriously change your life! 2. Screw It, Let's Do It! First of all, I'm sure you're already intrigued by the title! After reading this book, I became a huge fan of Richard Branson! He's just one of those entrepreneurs you can't help, but love! He has a great personality and quite an interesting life story. I mean, when a man owns more than 400 companies, that means he's definitely done something right in his life! 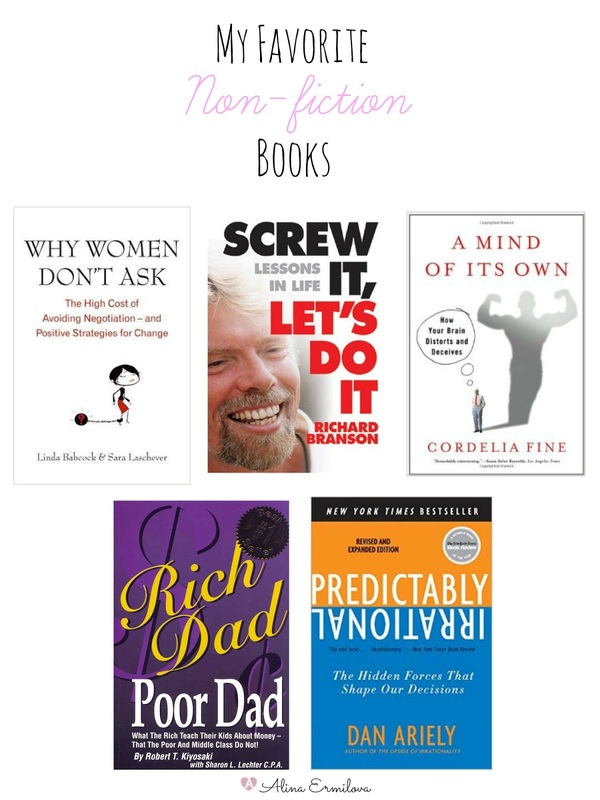 The book is basically a collection of Richard Branson's lessons and life mottos. Entertaining and highly motivational, if you're passionate about business, you'll love it! You think you have full control over your mind? Think twice! After doing some major research, Cordelia Fine provides us with a bunch of new information, showing that the human brain is in fact stubborn and emotional. She never fails to point out the irony of the situations research has uncovered, which makes the book incredibly entertaining on top of everything else. But as she hints, you have to let the brain's attempts to deceive you continue, or you might well go insane. The book is written by Robert Kiyosaki who had 2 dads while growing up - his real father and the father of his best friend, his rich dad. He talks about the ways in which both men shaped his thoughts about money and investing. This book will change your look not only on money, but also on education. Robert talks about how the education system is too close-minded and often times growing up we're taught that the only good way to make money and be successful is to go to college, get a degree and secure a stable job. Well, that wasn't true back then and is sure as hell not true now and that book shows you why. It also shows how important it is to educate yourself on the subject of finances, something they don't teach you at school. The book will inspire you to do what you love and make money off it. And here's one of my favorite quotes: "I have never met a rich man who hasn't lost a lot of money, but I have met a lot of poor men who have never lost a dime." Well, there you have it! I'd love to hear about your favorite non-fiction books, as I'm always on the look out for the new ones to read!